Imagine a kitchen without sinks. It can make work extremely difficult. However, even though sinks are essential, it’s crucial to install premium quality. With different types, stainless steel kitchen sinks are durable and stylish. They are also easy to clean compare to other types. This is because they don’t get corroded due to strong solutions or cause stuck dirt in crack and crevices. With reduced weight, this equipment are easy to install unlike other heavy sinks. Well, cheap quality stainless steel doesn’t last. With that, it calls for homeowners to be extra careful to ensure you can enjoy durability and performance. Regarding the available space, there come sinks with varying sizes, meaning it’s possible to choose right some for your kitchen installation. In fact, some are easy to install and don’t need permanent installation. When you want to enjoy great utensil washing, there is no shortcuts stainless steel kitchens sinks are the best options. 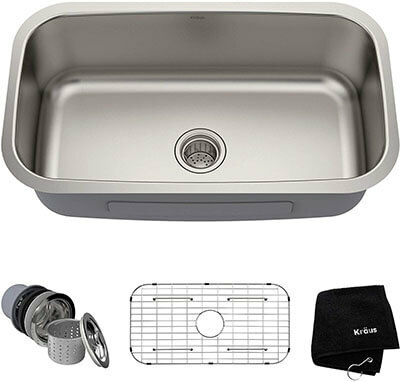 The Kohler stainless steel kitchen sink measures 33 x 22 inches with a basin depth of 8 inches. 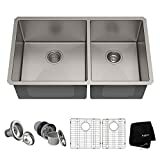 The double basin design gives you both a medium and small basin so you can separate the dirty dishes from the clean ones. It also gives you enough room to clean large pots and pans. 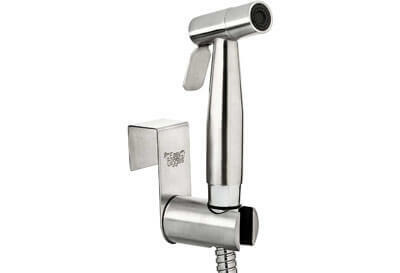 The 18-gauge stainless steel is both stain and rust resistant. It is equally easy to clean and maintain. Its clean look and neutral tone truly complements any kitchen style. Kohler’s kitchen sink uses the SilentShield technology to help reduce irritating noise from running water and garbage disposals. This kitchen sink is made from type 304 stainless steel which is a mix of nickel and chrome. This material makes it resistant to stains, rust, and dents. The surface is also scratch-proof and highly durable. 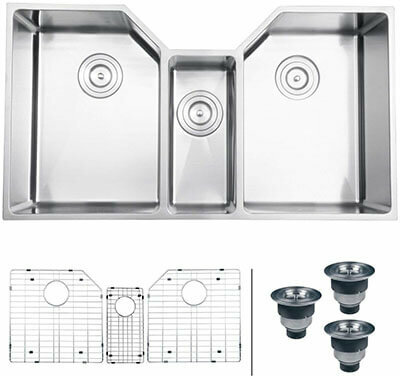 The Houzer kitchen sink has a 3.5-inch drain opening and a depth of 9 inches. 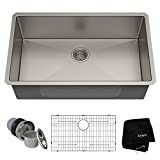 It can fit a sink base of 30 inches. The super silencer pad made of rubber is one of this model’s main selling points. The pad helps to reduce the noise of running water and clattering dishes. 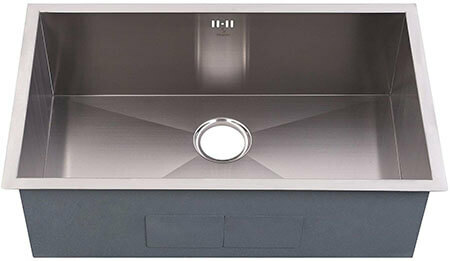 The Kraus’ durable and sleek design makes it rank among the best stainless steel sinks on the market. 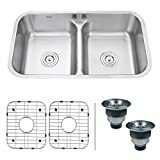 The single bowl kitchen sink has an extra deep 10-inch basin to accommodate large dishes easily. It is equipped with a thick rubber dampening pad. 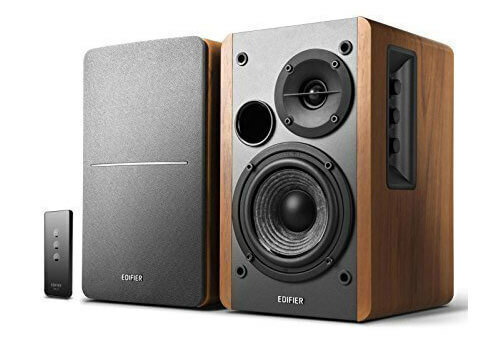 The non-porous surface is corrosion-resistant, stain-resistant and scratch-proof. The stainless steel kitchen sink has a length of 31.5 inches and a width of 18.38 inches. The drain is at the center with a 3.5” opening. 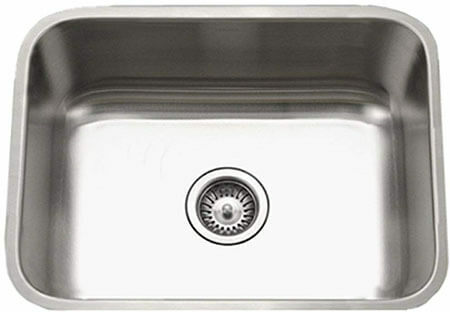 Kraus undermount stainless steel sink is designed with slightly round corners to make maintenance an easy job. 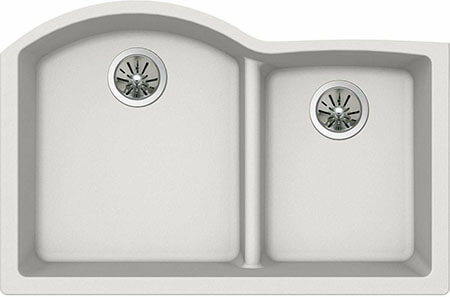 The Ruvati model is a triple-bowl undermount kitchen sink with a luxurious satin finish. The sinks also come with basket strainers and bottom rinse grinds for extra convenience. 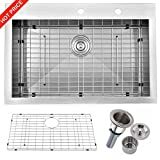 The drain is strategically placed to ensure the dishes don’t settle on it and prevent water from flowing. This sink also features drain grooves on the bottom that channel water towards the drain. The 35-inch sink’s bowls all have different dimensions and depth. The left bowl is 9 inches deep, the middle one is 7 inches deep while the right bowl is also 9 inches deep. The sink’s sound guard padding and undercoating are among some of the best features of this model. 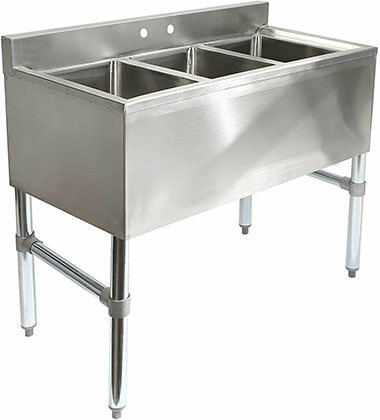 This is a 3-compartment commercial underbar sink made from a combination of 16-gauge and 18-gauge 304 stainless steel. It is among the best stainless steel sinks used in bars, restaurants or other commercial settings. The NSF-certified under-counter sink was truly designed for high-volume use. The bowls are quite large and have plenty of room to clean a lot of utensils, big or small. The sink’s rounded edges allow easy cleaning and maintenance. The legs have cross leg braces to provide extra stability. The RVM4250 model is an undermount single bowl kitchen sink measuring 30 x 18 inches. It is perhaps the largest sink on this list with a bowl that is 9 inches deep. The sink comes with a standard 3.5-inch drain opening that fits all garbage disposal units. The rim matches the inside of the sink so it can be installed either undermount or top mount. 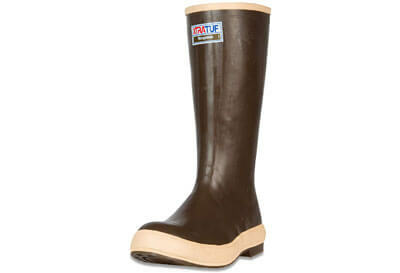 You’ll love the sleek satin fish because it is not only durable but also easy to maintain. It’s easy to spot this sink from other models because of its unique design. 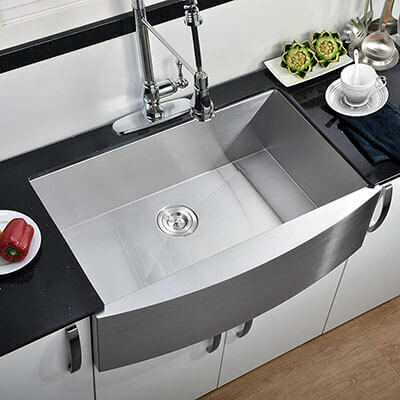 The single bowl kitchen sink boasts a modern minimalistic design with a brushed satin surface. It is large and 10 inches deep to give you enough room for both large and small utensils. The sink measures approximately 30 x 18 inches and fits at least 34-inch cabinets. The undermount kitchen sink also has sound insulation with dampening pads for extra convenience. 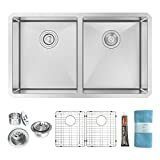 The stainless steel double sink makes it easy to separate dirty dishes from the clean ones. 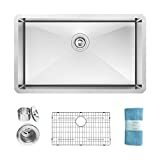 The sink has a low center divider that makes it easy to handle and clean large pans and pots. It installs beneath the countertop and has a fiberglass mat that reinforces the most used area. Just like any other stainless steel kitchen item, this neutral color makes it easy to match the sink with any kitchen style because it blends well. There are however different tones to choose from depending on your color preference or kitchen décor. The sink does not rust or scratch. It is also heat-safe to 535 degrees Fahrenheit. Thanks to the technology used to make this sink, there will be minimal sound and vibrations when you clean the dishes. 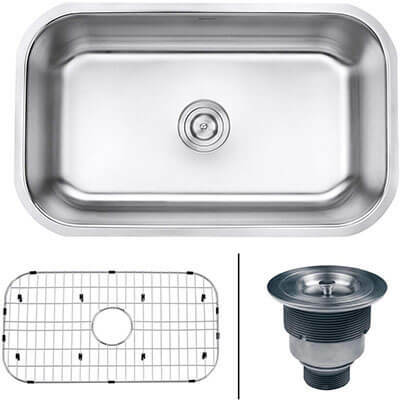 The Firebird 33 x 22-inch stainless steel sink truly comes with everything you need. 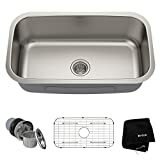 It has some of the most unique features that make it earn a spot among the best stainless steel kitchen sinks this year. 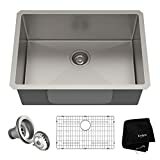 Along with the sink, there is an adjustable dish tray and a drain for convenience. The sink weighs 21.2 pounds and has a depth of 9 inches. The sink brushed stainless steel surface looks sleek and is pretty easy to clean. The 33-inch top mount sink is great for washing and preparing cooking items and ingredients. The tray adjusts from 14.5 inches to 22.25 inches to give you extra space to dry utensils or prepping. 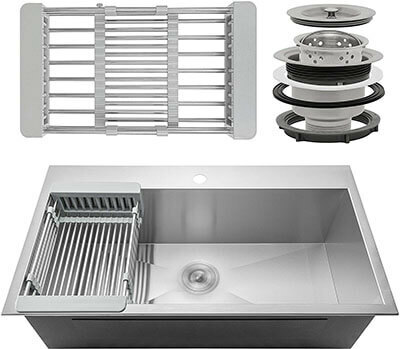 It is a great option when you want to upgrade to a modern stylish kitchen sink. Another product that truly deserves a spot on this list of the best rated stainless steel kitchen sinks is Comllen’s model. 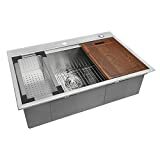 The single bowl kitchen sink is made of premium 304 stainless steel. This material is both rust-resistant and scratch-proof. 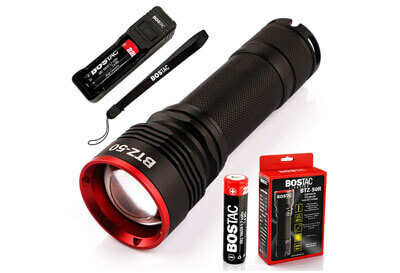 It measures 33 x 21 inches with a depth of approximately 10 inches. The sink further has a standard 3.5-inch drain opening that fits most garbage disposal units. Thanks to the thick rubber dampening pads, you can wash the dishes quietly without irritating noise from running water or clattering dishes.